When Charlotte (Charlie) St. Cloud arrives in Europe with her mom in 1947, the only thing on her mom's mind is an abortion for her daughter. Charlie has a different agenda. Her best friend and cousin went missing during World War II and Charlie is convinced she is still alive even though no one has heard from her. She started tracking her cousin down while in New York and was given one name: Evelyn Gardiner. Charlie abandons her mother and shows up on Eve's door, who is blind drunk and threatens to shoot Charlie. Eve is dealing with her own demons. As Eve learns that Charlie's cousin worked for the same restaurateur and profiteer that Eve did, she reluctantly agrees to help. We learn about Eve in WWI and how she was a spy in France, serving Germans at a local restaurant. Eve carries so much guilt and hatred with her and Charlie slowly starts to chip away to learn about Eve and what a hero she is. The last female-driven war novel I read was The Nightingale, which I loved. This one has a different tone with post-war time mixed with WWI. 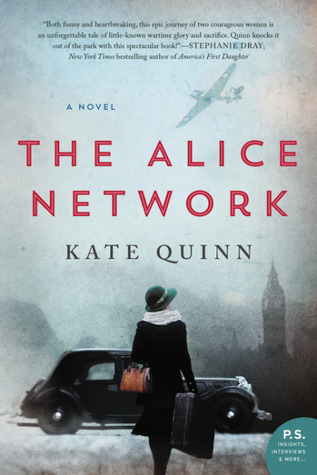 The description of the spy network and the stress involved with running and participating in such an operation was very interesting, especially from the female perspective. This is definitely the strength of this book. Charlie and her romance was the weakest part of this book. She could be a little whiny and annoying at times and the romance was completely predictable, and way too easy to help her get out of the predicament she was in with being an unwed future mother in the 40s. Overall a pretty good book, but I would still put The Nightingale ahead of this one.